When I was younger, I never exercised. I was more interested in high heels and makeup than running shoes and mile markers. I tried to avoid getting sweaty at all costs. I certainly never did it on purpose. So when I finally caught the running bug in my 30s, I was quite proud that I became a person who exercised regularly. I didn't realize at the time that if I expanded my workouts to include other exercises, it would benefit my running, and I could become a faster, more efficient, and less injury-prone runner. That was a lesson I learned the hard way. 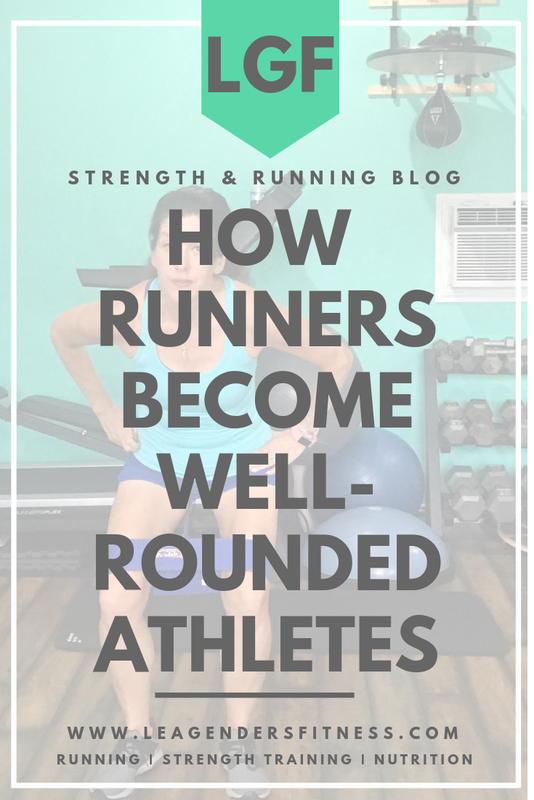 how runners become well-rounded athletes. Save to your favorite Pinterest board for later. I didn't worry about building or preserving muscle tissue. I thought weight training was for bodybuilders, and that wasn't me; I am a runner! I lost weight by running, but that weight loss was a mix of fat and muscle. When I lost muscle, I would look skinny, but my metabolism slowed down because muscle tissue burns more than five times the calories at rest than fat does. A pound of muscle burns 6.5 calories per hour at rest as opposed to a pound of fat, which burns 1.2 calories per hour. A slower metabolism then made it all-too-easy to gain the weight back, because I was eating the same amount of food but burning fewer calories due to the muscle loss. My weight went up and down for years. If only I had prioritized maintaining (or gaining) muscle with resistance training and protein intake, I could have avoided those embarrassing weight fluctuations altogether. 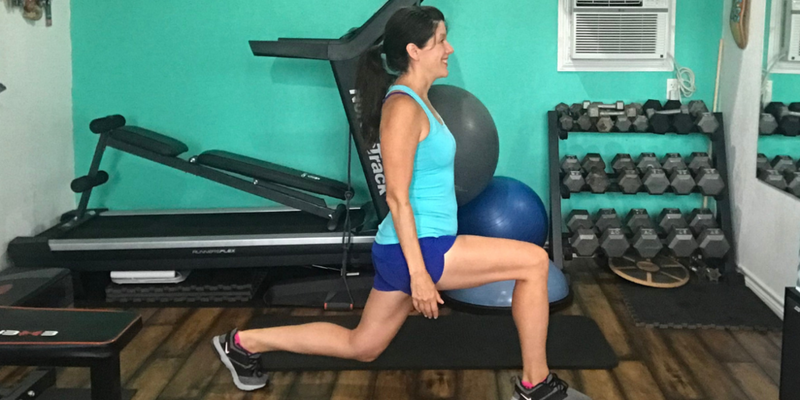 When I ran a lot of miles and didn't include runner-specific strength training I would suffer from hip and knee pain that would occasionally sideline my running. Muscles stabilize the joint, so it's essential for runners to strengthen the stabilizer muscles. For example, gluteus medius weakness may cause IT band issues and runner's knee (patella-femoral syndrome). I'll show you exercises to strengthen this muscle to lessen your injury risk. Muscle weaknesses can result in poor running mechanics, which can lead to injuries. When the stabilizing muscles are not functioning correctly to maintain proper form and alignment, then other muscles will try to compensate (take over the work), which can lead to dysfunction, pain or an injury. You might be thinking, "I know, Lea. I go to Spin class. I go to boot camp, play tennis and do Zumba." These activities are all great for improving general fitness, and if you love them, then its great to enjoy them for the health and mental benefits, but they won't necessarily help your running performance and prevent injuries. Runners need specific strengthening exercises to become more well-rounded athletes and perform better. Runners don't need to spend hours in the gym performing bench presses and bicep curls, but instead we need to focus on runner-specific strength to improve our running. For example, instead of the bench press to strengthen your chest, work on push-ups, They strengthen the same muscles, but push-ups engage the whole body and build core strength and stability which will benefit running performance. When we run, we move forward in one plane of motion, the sagittal plane. Forward and back sagittal plane movements include running, of course, the forward lunge (shown) and squats. The major running muscles in the sagittal plane are glutes, hamstrings, calves, and abs. Strengthening these muscles can improve your running performance. Since we always run in the sagittal plane, it's is essential for runners to also build strength in the other planes of motion to stay healthy, balanced, and well-rounded. Side to side movements like a side lunge, walking side squats (shown) and leg abduction are performed in the frontal plane. Some of the running muscles in the frontal plane include gluteus medius and transverse abs. Frontal plane exercises strengthen the gluteus medius which can help ward off hip and knee pain. Rotational movements like a medicine ball lift and chop (shown) are in the transverse plane. Running muscles in this plane are abs obliques, gluteus medius, piriformis, and transverse abs. Watch this short video to see a demonstration of a movement in each plane of motion. Think about strength training, not as something you have to do instead of running, but exercises that you are privileged to be able to do, that will make you a stronger, well-rounded, less injury-prone runner. Spend 10-15 minutes before every run or 30 minutes three times a week to see the benefits of strength training for runners. Need help? Contact me to see if I have availability.